" Paul Barrere asked if I wanted to record on the project and I am so very glad I did. I found her voice very soulful and her songwriting very groove oriented. That is an attractive combination for me... I am very grateful to be part of her sessions "
"I love this album, and not just because I played on some of the songs. The songs are great, the production is spectacular, and Allison sings so well. I'd love it if all my friends would check this out and share with their friends." " Since I never bother to write about the artists whose work doesn’t move me, you can probably guess that I think Allison August and the musicians that have surrounded her for this album put together a damn good album. " Melody has defined Allison’s life because she has always been surrounded by music. Allison is a fourth generation musician who, from childhood, dreamed of joining the family business. She grew up listening to her grandmother’s violin and viola, her grandfather’s cello, and her parents’ pianos. Allison’s grandmother was a conductor and orchestra violinist, her grandfather was first chair cellist. Her father taught jazz theory at a University and performed all around Europe, her mother is a concert pianist and celebrated composer. On her father’s side, her grandmother played guitar and sang cowboy songs. Over more than a century of making music, they have played with some of the greats, talents like Sinatra, Elvis, and the Jackson 5. Allison is proud to have performed and recorded with members of Little Feat, Tower of Power, Parliament Funkadelic, Lenny Kravitz, Lionel Ritchie, and many others. As a child, she sat through hours of her family’s music lessons, rehearsals, and performances; she wanted to be a part of that world. Allison spent hours lying on the floor with giant headphones on, studying the family vinyl collection. Her favorites were the Beatles, Elton John, Ray Charles, Billie Holiday, and Bessie Smith. From these icons she learned the basics of songwriting; she began writing songs at age 9 and joined her first band at 13. She became a working musician while still in High School, playing proms, parties and dive bars. Fellow band members snuck her in through the back entrance, where she hid until showtime. In College, she met aspiring musicians Dino Soldo, Bryan Head, and David J Carpenter. Allison and Dino started the band Barebones, signed with Monster Music and released “For the Mind, Body and Soul” in 1997. In 2016 she came back together with David J Carpenter, Bryan Head, and Dino Soldo to release a new album. Encouraged by one of her biggest influences, Paul Barrere of Little Feat; the four songs he agreed to play on became a whole album: “Holy Water”. 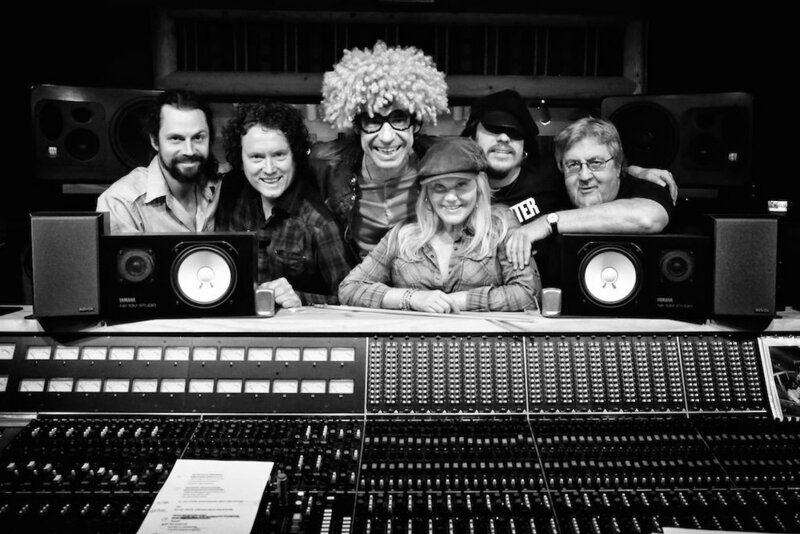 Also lending their talents are Coco Montoya, Greg Liesz, Josh Smith, and Lance Lopez. Her songs are inspired by the joys and tribulations of her life: marriage, divorce, motherhood, abuse, cancer, but above all, a love of music and hope for the future. “In the middle of treatment,” she started, “The guys convinced me to come into the studio. I was exhausted and in a lot of pain, but their persistence encouraged me to continue recording the album. One recording session in particular was… inexplicably magical. Greg Liesz sat down to play.” Reflecting on her experience with a puzzled look, she continued - “when he hit certain notes, I could feel it reverberating through my body - as if the tones were somehow altering me on a molecular level.” She spoke with an awareness of the peculiar nature of the words coming out of her mouth - with incredulity of the truth of the situation, but I urged her on - “It was as if he was changing my chemical makeup… healing me. It was super weird - an out of body experience, for certain. I sat back, amazed by the power coming from this quiet, unassuming guy. I’d never experienced anything like that before” She repeated. Music’s ability to inspire and invigorate is nothing new. Whatever the exact nature of what Allison felt that day is, it had a definite effect. This resilient woman felt something - something simultaneously mysterious, welcomed, and beautiful. Finally, as Allison would say: peace, love, and music. From a friend, Samantha Reinard. For an explanation of the “subatomic symphony” and the source of the quote, see this article. Norcal fam comes to visit. My BFF and rock throughout.